Looking for some new anime to buy and watch? Do you need to find that “one more disk” to complete that box set you’ve been working on collecting for the last 5 years? (gotta catch ’em all…) Are you bummed that you didn’t make it back to the dealers room on the last day of con to buy that series you really had your eye on? Maybe you’re into manga, and are looking to buy some of that as well? We here at Otaku no Podcast are proud to present our latest enhancement to the already super crowded and confusing Otaku no Podcast website, that aims to help you do all of the above, and more. 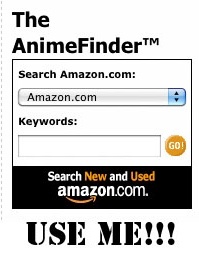 Introducing the all-new Otaku no Podcast AnimeFinder™ (patent pending), a handy dandy widget thingie that harnesses the awesome technology and inventory of Amazon.com, quite possibly Earth’s biggest online store, to connect you with the item(s) you seek, and allows you to buy them. Amazon has a truly mind-boggling selection of goods, from anime DVDs (even those newfangled Blu-ray thingies), soundtracks, manga, character goods, artbooks, and all manner of other stuff that’d make any otaku drool with envy. Their prices are often fairly competitive too (and let’s face it, if you live in some hick town without any good anime stores, any port in a storm, right?) and they ship practically anywhere, at fairly decent rates to boot. And, oh yeah, if you buy through us, we get a small cut of the proceeds. It doesn’t cost you anything extra, and the money helps keep the lights on and the bits flowing. Which, of course, is much appreciated.